LISTEN. THESE THINGS. Boring beige biscuits that no one particularly likes or dislikes. What are they called? Originated c. 1860, simply named because of their ‘nice’ taste. This was apparently changed when Queen Victoria visited Nice in France and took these, her favourite biscuits with her. This has been a bone of contention in Ireland for a very long time. The results of a 2014 poll by DCU lecturer Dónal Mulligan found that people from Dublin are more likely to pronounce it like ‘fleece’, while people from the country pronounce it like ‘mice’. 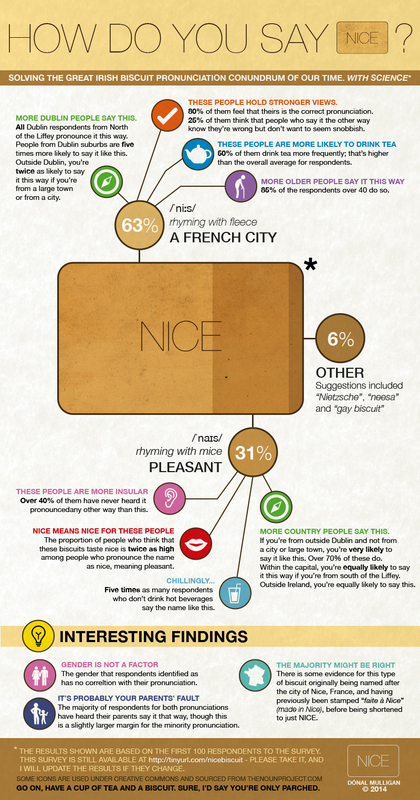 But let’s go at it again: How do you, personally, regardless of whether it’s right or wrong, pronounce ‘Nice biscuit’? Email “The old debate over how to pronounce 'Nice biscuits' is rearing its ugly head again”. Feedback on “The old debate over how to pronounce 'Nice biscuits' is rearing its ugly head again”.